Depression is a common chronic condition—second to hypertension—and is estimated to be the leading cause of morbidity and disability worldwide. It is common across all age and cultural groups; but, under-resourced communities, especially communities of color, have less access to care and evidence-based treatments. 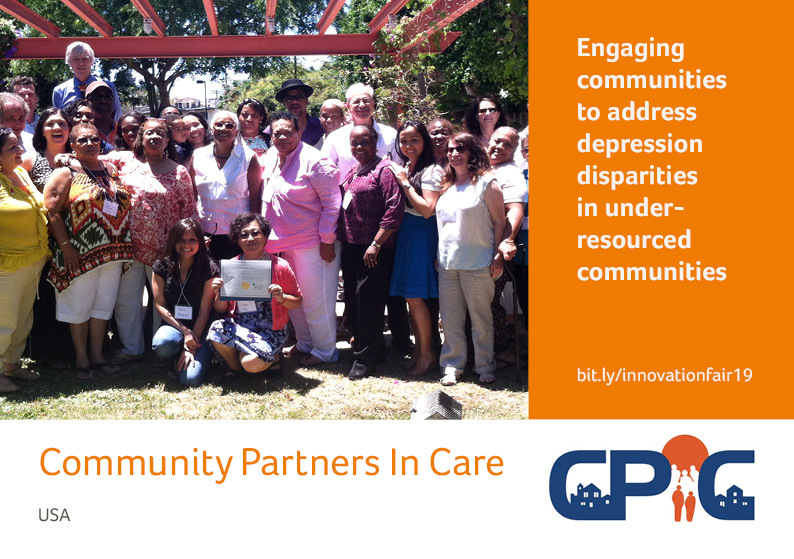 Community Partners in Care (CPIC) compared the effectiveness of diverse safety net providers working together using a participatory network approach, and a technical assistance approach, to implement quality improvement (QI) for clients’ mental health-related quality of life (HRQL) and services use. “Working with academia has increased my awareness of what researchers do. They are getting an understanding of what is important to patients, and collaborating with them has increased my trust in them. Through CPIC, diverse safety net providers working together to a technical assistance model were compared through a rigorous randomized trial involving over 1000 depressed clients drawn from 93 healthcare and community-based programs. The clients were primarily African American and Latino, the majority met federal poverty criteria and had multiple chronic medical conditions, nearly half were uninsured and at high risk for being homeless and many had substance abuse problems. A model to bring together agency leaders and community members from diverse sectors of the community including mental health, primary care, public health, substance abuse, homeless-serving, other social services, and “trusted locations” like faith-based programs, community centers and hair salons. This collaboration is supported through 4 months of planning to review evidence-based approaches to improve depression services and outcomes, fit those programs to their agencies and community and create a network across agencies to provide more comprehensive support. The key feature of the approach is community engagement, with equal power sharing and authority in the planning process, to develop an evidence-based toolkit for depression. The planning is followed by training as directed and supervised by the community planning group, comprising strong community leaders and clinical experts. A model focused primarily on healthcare sectors alone, using the same evidence-based toolkits to improve depression services and outcomes. The implementation is based on a technical assistance model, such as would be provided by a disease management consulting firm. Based on this study, LA County has developed a Healthy Neighborhoods initiative that is implementing the community engagement model to improve mental health across diverse neighborhoods. Community-partnered cluster- randomized comparative effectiveness trial assessing outcomes at baseline, 6-month, 12-month and 3-year follow up. From 93 randomized programs, 4,440 clients were screened and 1,322 clients were identified as depressed by the 8-item Patient Health Questionnaire (PHQ-8). 1,246 clients enrolled and 1,018 clients completed baseline or 6-month follow-up. Results showed that diverse safety net providers working together was more effective than technical assistance at improving mental health-related quality of life (HRQL), increasing physical activity and reducing homelessness risk factors, rate of behavioral health hospitalization and medication visits among specialty care users (i.e. psychiatrists, mental health providers) while increasing depression visits among users of primary care/public health for depression and users of faith-based and park programs (each p<0.05). In contrast to 6-month results, the findings did not show consistent effects on safety net providers working together to reduce the likelihood of poor client MHRQL and behavioral health hospitalizations at 12-months. Still given under-resourced communities’ needs, diverse safety net providers working together favorable profile, and the absence of evidence-based alternatives, community engagement remains a viable strategy for policymakers and community to consider. Analysis of 3-year follow up findings is still under way.